The concept of sampling vegetation by point quadrat is well established (Levy & Madden 1933; Goodall 1952), and is a theoretically sound method for determining vegetation cover. The concept is straightforward. To determine the cover of a given species within an area, a large number of quadrats of zero area (i.e. points) are lowered vertically through the vegetation at statistically independent locations, and intercepts with vegetation are recorded. The proportion of species 'hits' over a large number of point quadrat samples yields an unbiased estimate of the cover. Of course, an infinitely small quadrat is, in practical terms, impossible to achieve, and any 'point' will in reality have a finite area. This introduces bias resulting in an over-estimate the actual cover, as described in detail by Goodall (1952) and Warren Wilson (1963). This bias can be minimised by using the smallest 'point' possible. For example, Roxburgh & Wilson (2000) used a sharpened needle with a diameter of 50 microns. However, even with points of a larger diameter the method is of much utility, particularly for detecting changes through time, and pins up to 4mm diameter are still routinely used. 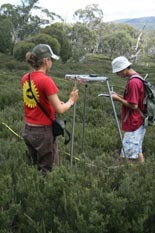 A large number of apparatus and methods have been devised for point-quadrat sampling. The most common have been either sighting tubes with cross-hairs, or mechanical pins. 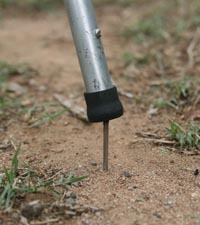 Pins are usually housed singly or in groups within a frame, and often have some mechanical mechanism, such as a spring, for gradually lowering the point through the vegetation, thus allowing visual observation of the species hits with the tip of the sampling pin as it passes through the canopy (Figure 1). 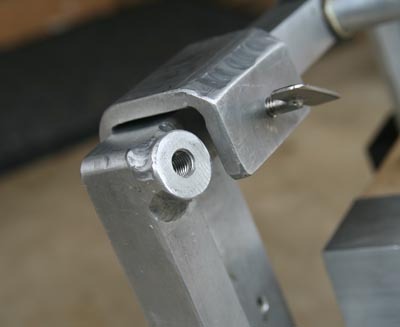 It is also possible to lower pins manually without the aid of a guiding frame, although great care must be taken to avoid observer bias (to avoid inadvertent 'aiming'), and to ensure the pin is lowered vertically. Manual lowering of the pin is particularly difficult when the canopy is multi-layered, and is therefore most suitable for prostrate vegetation, e.g. alpine tundra. Figure 1. 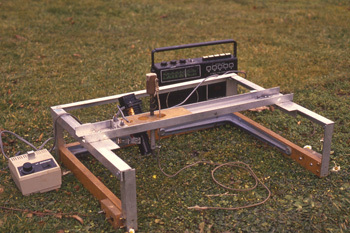 (a) Point quadrat frame used by Roxburgh & Wilson (2000) for sampling mown vegetation. The sharpened sewing needle 'point quadrat' is spring loaded and can be lowered through the vegetation by pulling on the string from below. The point quadrat assembly slides east-west and north-south within the frame, allowing sampling within an area of approximately 40cm x 40cm. (b) a rack of five spring-loaded pins, as described in Radcliffe and Mountier 1964. One of the great limitations of the traditional mechanical point quadrat fitted within a frame is that the maximum height of the vegetation able to be sampled is limited to the height at which the pin mechanism can be elevated above the vegetation when at rest. For example, sampling shrub vegetation of 1m height would require at least a 1m long pin, the top of which would, at rest (i.e. prior to lowering through the vegetation), sit at least 2m above ground level. Such a frame would be too unwieldy for practical use, especially in dense vegetation. One solution to this problem is to dispense with the mechanical frame, and instead use an optical laser as the 'point' quadrat. A number of laser point-quadrat sampling designs have been proposed (e.g. Eek and Zobel 2001; Radtke and Bolstad 2001; VanAmburg et al. 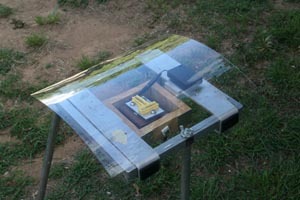 2005), and at least one device is commercially available. 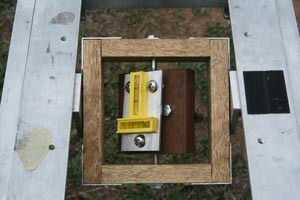 The remainder of this article describes the design and construction of a frame for laser point-quadrat sampling in vegetation up to 1.3m canopy height. The specifications of the frame were simple. It had to project a vertical laser beam through the vegetation, even on uneven ground; it had to sit above an approximately 1m high canopy, but also be used comfortably in lower-stature vegetation; the laser point had to be visible in daylight, but not be so bright that it becomes a 'diffuse' glow; and the whole construction had to be light and maneuverable enough to transport comfortably through an often dense and shrubby woodland understory. The solution is shown in Figure 2. Aluminium and wood are used for weight and stability. The laser diode sits within a gimbal that is manually leveled prior to each determination to ensure vertical. This whole assembly sits on a tripod. Two sets of inter-changeable legs provide a 'shrubland' and a 'grassland' version. Figure 2. 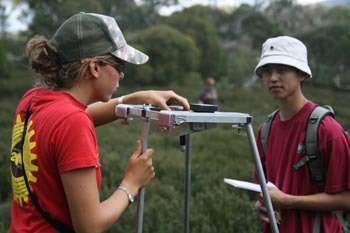 (a) The point quadrat sampling frame for shrubland cover estimation, being used here by UNSW 3rd-year ecology students to estimate the cover of the subalpine shrub Bossiaea foliosa. The laser sits within a gimbal that is able to be leveled to ensure vertical, regardless of the terrain. (b) the grassland version, with shorter legs. For the laser we used the cheap and widely available 1mW, 4.5V red (650nm) laser diode that is commonly found in presentation pointers etc. (Figure 3a) The beam has low enough power to be safe for everyday use, is bright enough to be seen in daylight (though it requires some shading when used in direct sun, see later for more details), and has a well defined umbra with a sampling point of around 1mm diameter (Figure 4). An 8.5mW, 3V green (532nm) laser with higher visibility was also tested (Figure 3b), however the high power of this laser resulted in a point that was too bright, with too much penumbral light obscuring the sampling point. This laser was also deemed too dangerous for everyday use (these units can light up the underside of clouds at night, and are used by amateur astronomers for pointing out objects in the night sky!). They also run hot, preventing continuous use (yes, they burn out after a few minutes left on; yes, I found that out the hard way!). Figure 3. The laser diodes. (a) The 1 mW, 650nm red used in the frame. (b) The 8.5 mW, 532nm green diode that was also trialed. Figure 4. The laser 'hit' on vegetation. The laser diode used was sourced from a commercially available pen pointing device, purchased from Jaycar Electronics for less than A$10. 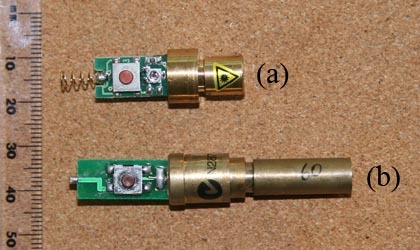 As shipped, these pens are powered by 3 small 1.5V watch batteries, and require continuous pressure on the side switch for the laser to remain lit (Figure 5a). 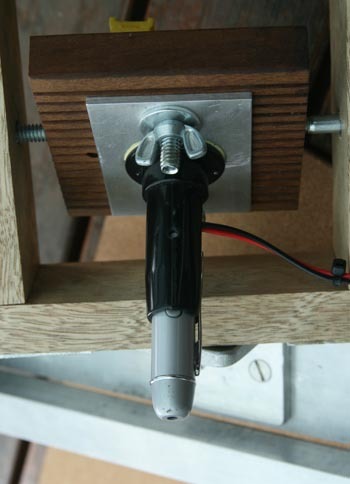 These pens are also fitted with an aperature plate with a small drilled hole to provide a point light source (as these diodes have a rectangular-shaped beam without modification). To extend battery life the unit was disassembled, and the original batteries replaced with a switched 3 x AA battery box (Figure 5b). 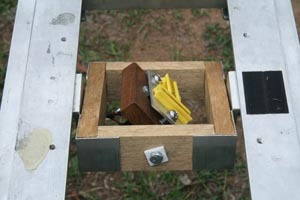 This box is attached to the sampling frame with velcro. To allow continuous operation the 'on-off' push-button switch was forced to be permanently 'on' by sliding the pointer into a snugly fitting plastic tube (Figure 5c), and then using the on-off switch on the battery box for operation. Figure 5. (a) The laser pointer as purchased. (b) The laser pointer following the addition of the battery pack/external switch. (c) The laser pointer positioned within the plastic tube to keep the push-button permanently depressed. A simple gimbal allowing east-west and north-south movement was used to allow adjustment of the laser point to vertical (Figure 6.). 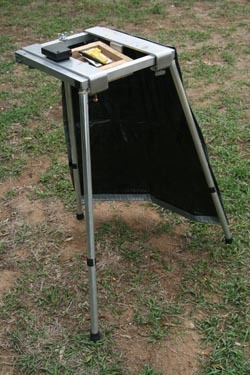 Teflon washers were used to allow smooth manual adjustment without backlash, but with enough friction to prevent unwanted wind-induced movement. A free-swinging gimbal was also trialed, that ideally would have avoided having to manually set the level for each sample point, however it was found that even the slightest air movements sent the whole assembly swinging, and this design was quickly abandoned. Figure 6. The gimbal construction. The black rectangle on the top of the frame is a velcro patch for attaching the battery pack. Manual leveling is achieved by centering the yellow east-west and north-south builders-levels glued to the top of the assembly. These levels sit on top of a spring-loaded adjustable aluminium plate, which is required for fine-tuning, and to adjust for the shonky manufacture of the cheap laser pointers (where the laser diodes are not usually centered within the tube, and can be up to as much as 20 degrees off-centre!). 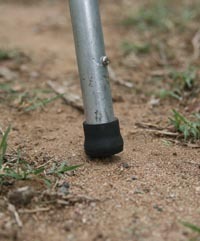 The tripod legs screw directly into the gimbal frame (Figure 7). One set of legs elevates the unit 130cm above the ground to allow sampling of shrubland vegetation, the other set of legs elevates the unit 50cm for use in grassland. Figure 7. Threaded socket to attach the legs to the frame. Shade cloth. The laser beam is visible under direct sunlight, but only just. Under these conditions extra shading is recommended to make locating the point within the vegetation canopy easier. Figure 8 shows a simple shade frame made from gardeners weed cloth, attached to the legs by velcro. Alternatively, the person recording data can stand in a position that shades the area being sampled. Rain cover. A transparent plastic cover to protect the electronics and moving parts from the worst of the elements, attached with, of course, velcro (Figure 9). Leg spikes. Because of the relative high centre of gravity of the grassland version, on very uneven ground (particularly where feral pigs had been busy!) the unit was prone to toppling over. 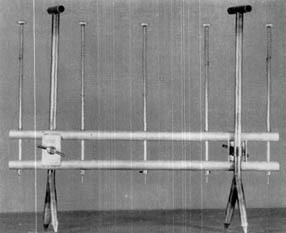 The addition of spikes to the tripod feet soon fixed that (Figure 10). Figure 10. Leg spikes for added stability. Carry case. A foam-lined carry case makes transporting that much easier (Figure 11). 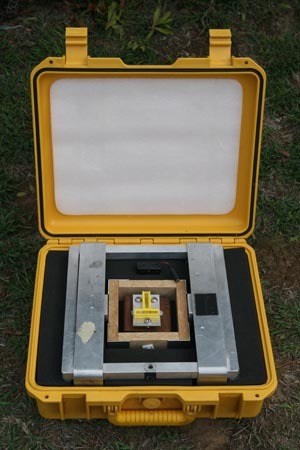 The sampling frame performs well in both grassland and shrubland vegetation. Because the unit has few moving parts it is robust, with the only required adjustments being occasional tightening of the bearings to maintain optimal friction. The 3xAA battery pack lasts approximately 16 hours with the laser continuously on. Battery life could be extended significantly by switching off the laser between sample points, and/or adding a battery pack with greater capacity. With practice, manual levelling soon becomes second nature, only taking a few seconds per measurement. As noted above, the laser beam has adequate brightness and resolution, providing shade cloth is used in full sunlight, or the data recorder is able to stand in a position to shade the point. Able to sample vegetation up to 1.3 m in height. The fixed-frame design keeps the laser point stationary, freeing up the observer to concentrate on examining the vegetation, and to accurately record multiple hits within the canopy by gently pushing aside overlapping vegetation. The sampling point is 1mm diameter, which is greater than the theoretically ideal 'point', and thus will yield cover estimates greater than the 'true' cover of the vegetation (Warren Wilson 1963; Goodall 1952). The point can be difficult to see under full sun, and requires shading under these conditions. Eek, L., Zobel, K. 2001. Structure and diversity of a species-rich grassland community, treated with additional illumination, fertilization and mowing. Ecography 24, 157-164. Goodall, D.W. 1952. 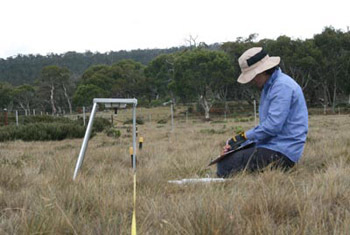 Some considerations in the use of point quadrats for the analysis of vegetation. Australian Journal of Scientific Research, Series B, Biological Sciences 5, 1-41. Levy, E.B. & Madden, E.A. 1933. The point method of pasture analysis. New Zealand Journal of Agriculture 46, 267-279. Radcliffe, J.E., Mountier, N.S. 1965. Problems in measuring pasture composition in the field. Part 1. Discussion of general problems and some considerations of the point method. New Zealand Journal of Botany 2, 90-97. Radtke, P.J., Bolstad, P.V. 2001. Laser point-quadrat sampling for estimating foliage height profiles in broad-leaved forests. Canadian Journal of Forest Research 31, 410-418. Roxburgh, S.H. & Wilson, J.B. 2000. Stability and coexistence in a lawn community: Experimental assessment of the stability of the actual community. Oikos 88, 409-423. VanAmburg, L.K., Booth, D.T., Weltz, M.A., Trlica, M.J. 2005. A laser point frame to measure cover. Rangeland Ecology and Management 58, 557-560. Warren Wilson, J. 1932. Errors resulting from thickness of point quadrats. Australian Journal of Botany 11, 178-188.